The competition between the major sellers of seafood all over the world, like High Liner Foods, Grupo Pescanova, Beijing Princess Seafood International Trading, The Union Frozen Products, Nomad Foods Europe, Leroy Seafood, Marine Harvest ASA, Iglo Group, Clearwater Seafood, and AquaChile, portrays competitive landscape which is dominant in the global market for frozen seafood, reports Transparency Market Research (TMR). These major sellers are currently challenging each other based on the price differentiation and product innovation. The report states that in the future, the sellers are likely to adopt strategic partnerships as a means to expand their regional reach. 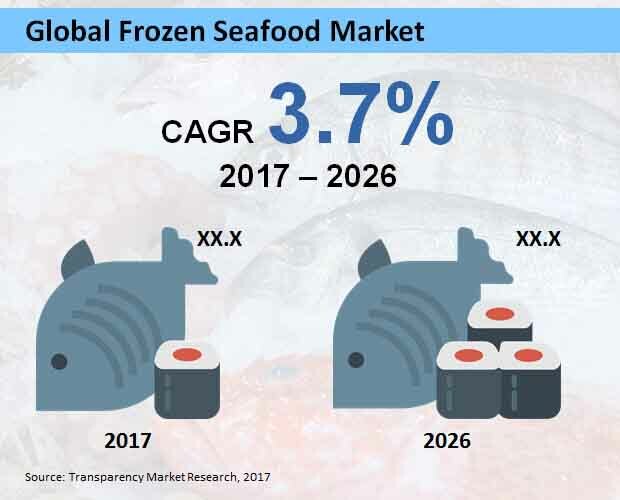 TMR estimates that the world frozen seafood market is liked to exhibit a 3.7% CAGR, which is considered as a slow rate during the forecast period. The market in terms of revenue is expected to reach US$32 bn by 2026. Rise in uptake of frozen fishes is considerably any other product present in this market. Scientists expects this trend to continue in the years to come. Food chain services holds major end users of frozen sea food all over the world and are projected to do in the years to come. On the basis of geography, the frozen seafood market is prominent across APEJ, Japan, Latin America, Europe, North America, and the Middle East and Africa. Among these Europe holds the top position and is expected to continue so in the years to come. Europe which significantly uses variety of fishes in their cuisines rises their demand for frozen seafood. Another factor favoring the European frozen seafood market is the large number of cold storage services across the continent. According to the author, the increase in demand for seafood products from isolated locations is turning out to be the main reason behind the uptake of the market. Abundance existence of cold chain arrangements, is bolstering the market, as this helps in simplifying the distribution of the product. Innovation in the cold chain arrangement is likely to propel the global frozen seafood market in the years to comes, according to the report. Crustaceans among other frozen seafood market is projected to be to top seller in future. Crustaceans, worth of US$8 bn were sold across the world in 2017.Good profit and increase in uptake of exotic seafood is likely to rise the sales of crustaceans. Frozen fishes are estimated to cover 30% of the frozen sea food market during the forecast period. On the flip side, the complex nature of the techniques used in the processing for the manufacturing of the frozen sea food products is predicted to test the organizations business outlook in the world frozen seafood market. The of market is also expected to curb due to lack of standardization, on the basis of employing freezing temperatures, proper seafood preservatives to be applied, and storage of seafood products at a different levels of refrigeration. Poor quality of cold storage services will contribute restraining the market in the future, studies the report. The demand for frozen fishes is relatively higher than other products available in this market. Europe has acquired the leading position and is projected to continue on the top in the years to come.